Paris designs by (from left) Worth, Jenny, and Lucien Lelong. 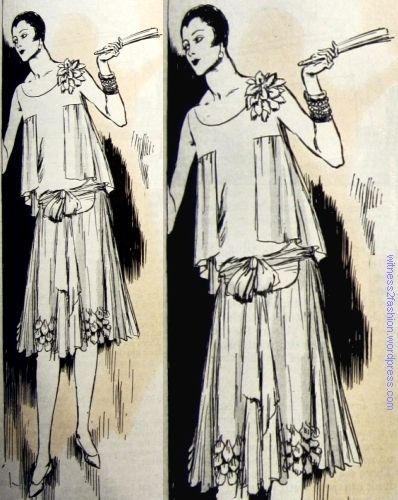 Soulie’s sketches for Delineator magazine, June 1926. Butterick kept an office in Paris, where, among other things, the latest collections were sketched. 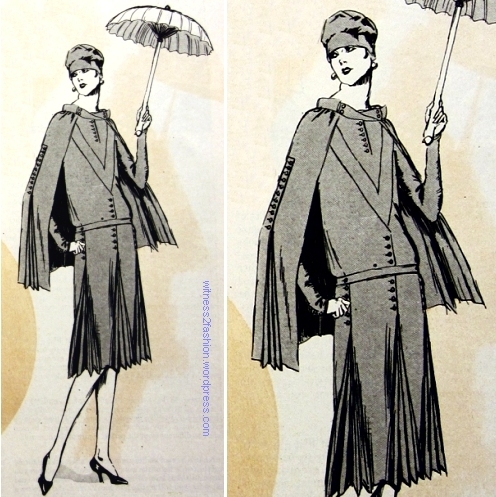 These sketches by Soulié were a regular feature in Butterick’s magazine, The Delineator. Many of these designers’ names are still very familiar (Worth, Patou, Molyneux) while others are less often mentioned. 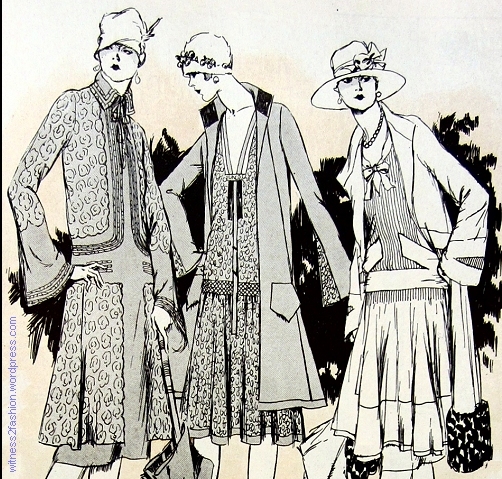 Jenny and Renée often created lovely fashions in the 1920s. I photographed these illustrations from a bound copy of six issues of The Delineator, so this image of a gown by Patou is distorted by the curvature of the book, but the details are worth a look. Design by Jean Patou sketched by Soulie for Delineator, June 1926. I don’t claim a direct influence, but I have seen vintage dresses with similar details. 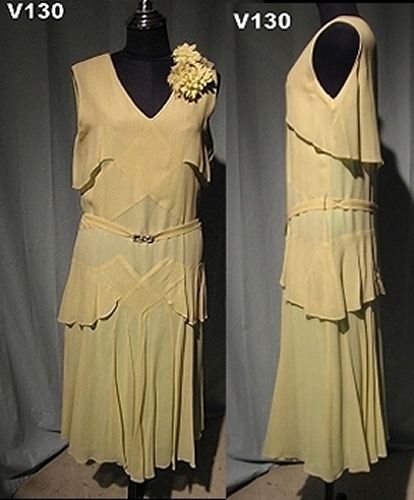 Fabric flower petals at the shoulder and a “bolero” effect on a vintage late twenties’ gown. 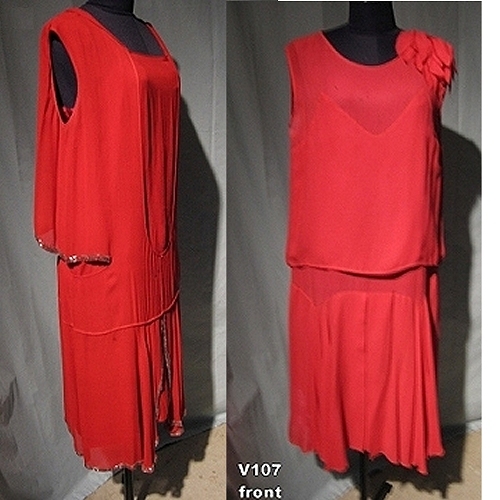 Two vintage twenties’ dresses; one has floating side panels that evoke Patou’s bolero; the other has a bolero effect falling all the way to the waist — and self-fabric petals at the shoulder. A cluster of petals, or a bow, on the left shoulder was often repeated at the right (or left) hip, perhaps with a drapery or cascade of fabric falling from there to the hem or beyond. This was a clever device for attracting attention away from unflattering horizontal lines and making the viewer’s eye travel up and down the dress instead of across it. 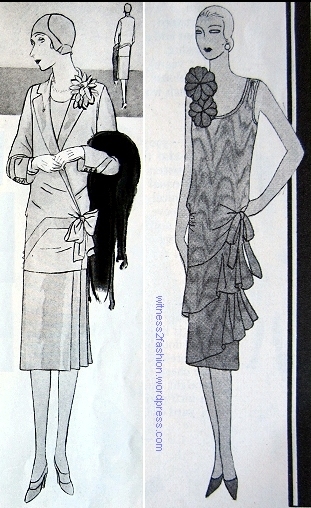 Butterick 2450 (Feb.) and 2490 (March), 1929. Trim at the shoulder and hip. Design by Renee, sketched by Soulie for Delineator, June 1926. Molyneux design sketched by Soulie for Delineator, June 1926. Cellophane was invented by a Swiss textile engineer named Brandenberger and perfected in time for use in gas masks in WW I. 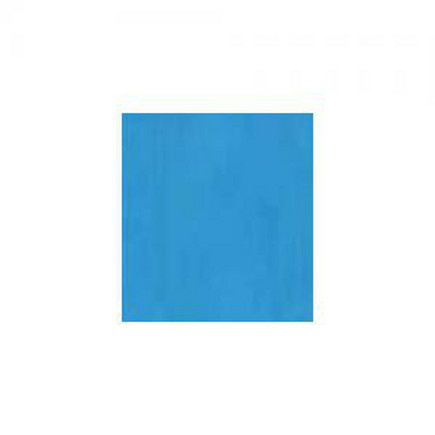 (Click here for a history of cellophane.) I do not recommend dry cleaning cellophane dress trims! 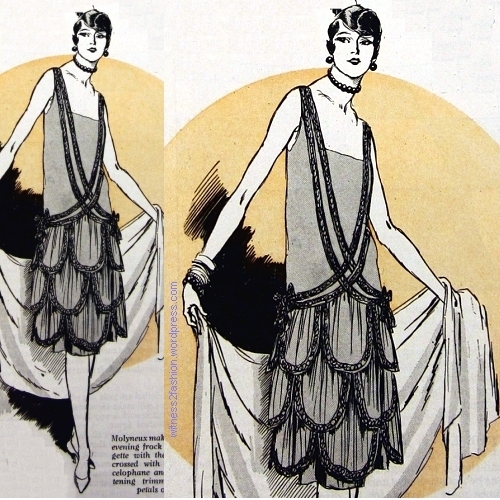 Perhaps the client who bought this 1926 evening dress also bought glittering this Molyneux wrap. 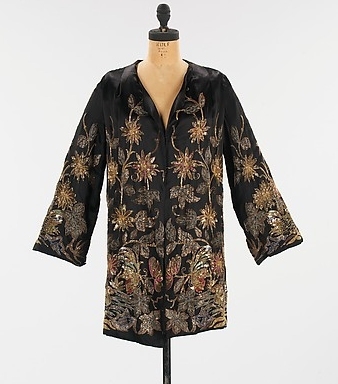 Evening jacket by Molyneux, 1926. Collection of the Metropolitan Museum. 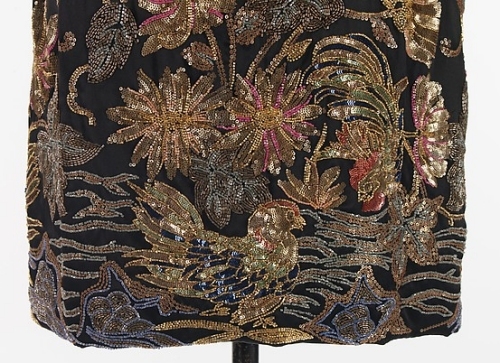 Detail of Molyneux jacket, from 1926. Collection of the Metropolitan Museum. To return to the outfits pictured at the top of this post, here they are shown full length, and later, I will show their details. “Worth puts a bolero and tunic of a reddish pink silk printed with roses over an apple-green front and skirt. The wide sleeves end in a green hem edged with three minute folds of the rose silk.” What a shame we can’t see this in color! 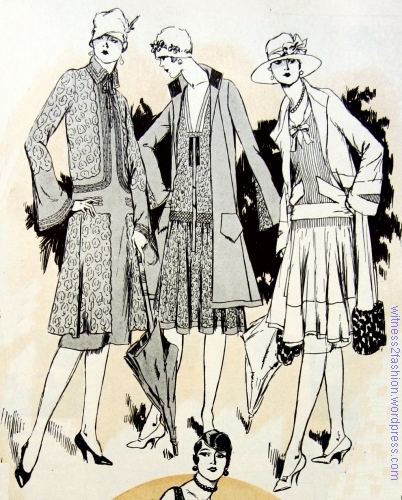 Pink and green outfit by Worth, Ash-pink and blue ensemble by Jenny, and a tucked georgette ensemble by Lucien Lelong; Delineator sketch by Soulie, June 1926. 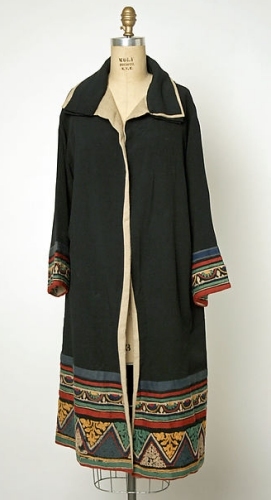 Embroidered coat by Jenny, 1926. Collection of the Metropolitan Museum. I had never heard of Jenny before. What a gorgeous coat! 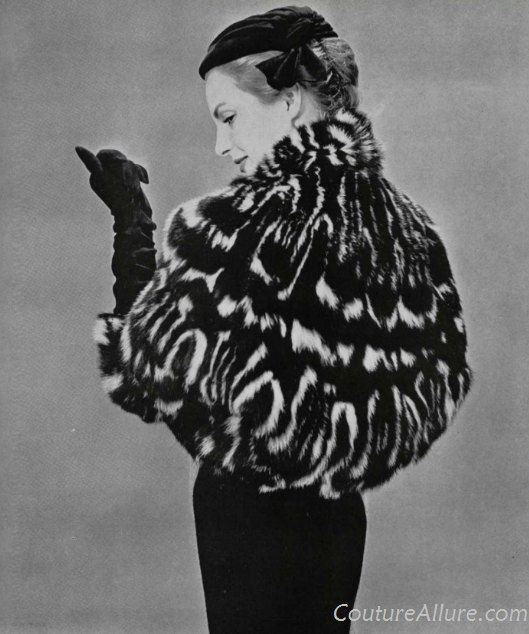 Love this time period in fashion, late 1920’s to early 1930’s. Beautiful!